These elegant white folding fans are fantastic favors your guests are sure to open up to Planning a summer event or destination wedding where temperatures may be soaring? Well, with these pretty white fan favors you can give your guests a cooling breeze no matter what the thermometer reads! These classic paper hand fans will keep you cool during the hot summer months,but they're also popular for decorating all year round. Many people are using premium paper hand fans for wedding favors. Besides,you can paint them,draw or paint,or stain on them,add your own creative stuffs on them. 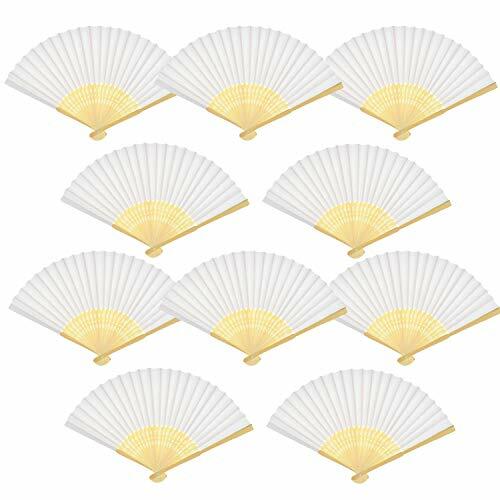 Bamboo fan folding size:8.26 *1.06 inch,open to 15.3 inch, small and exquisite can be put into bags. If you have any questions about this product by Teekia, contact us by completing and submitting the form below. If you are looking for a specif part number, please include it with your message.